All-powerful God, you are present in the whole universe and in the smallest of your creatures. You embrace with your tenderness all that exists. Pour out upon us the power of your love, that we may protect life and beauty... --Pope Francis, "A Prayer for the Earth"
Since his inaugural Mass in March 2013, Pope Francis has frequently reminded a global audience that care for creation is among his highest priorities. As a world leader with a background in science who heads a two thousand-year-old Church, the pope is uniquely qualified to articulate a compelling vision and mission for the future. 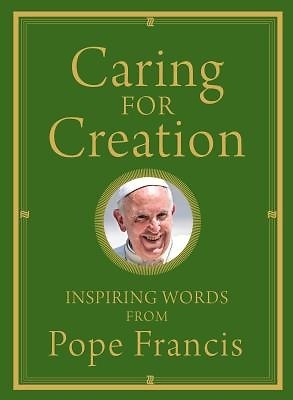 The writings, homilies, prayers, talks, and even tweets of Pope Francis in this book gather his most important and inspiring words about our shared responsibility to protect, nurture, and care for "our common home." The planet is in peril, the pope is telling us, along with the well being of the poor who depend on the earth's natural resources. He chastises world leaders and challenges ordinary people, reminding us that our foolish actions and careless decisions are placing lives at risk. He decries our current assaults on the natural environment and warns of the consequences of climate change. Still, his message is always ultimately one of hope. In Caring for Creation, Pope Francis's words reveal that he believes we can move towards a new kind of conversion--a higher level of consciousness, action, and advocacy that will spark "a bold cultural revolution."